All Reports include digital pictures for better understanding. Making your home inspection report easy to read and understand. Structural System: Foundation, wall structure, floor structure, ceiling structure, and roof structure. Exterior: Wall covering, flashing and trim, exterior doors, attached decks, balconies, steps, porches and their associated railings. Eaves, soffits and fascias. Grading, surface drainage, vegetation and retaining walls on the property if any of these may adversely affect the building. Plumbing System: Interior water supply and distribution system, including all fixtures and faucets. Drain, waste, and vent systems. Water heater. Vent systems. Flues and chimneys. Drainage sumps, sump pumps, and related piping. The functional flow of all fixtures and drainage of all fixtures. Electrical Systems: The service drop, entrance conductors, cables and raceways. Service equipment and main disconnects. Service grounding. Interior components of the service panels and subpanels. Overcurrent protection devices and a representative number of installed lighting fixtures, switches, and receptacles. Amperage and voltage rating of service. Location of main disconnect and subpanels. Wiring methods. Absence of smoke detectors. 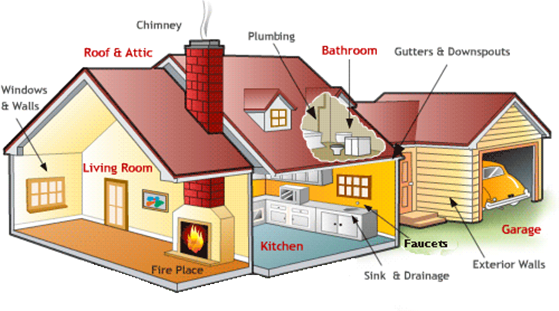 Fireplaces and Solid Fuel Burning Appliances: Vent systems, flues and chimneys. Heating System: Installed heating equipment, vent systems.flues, and chimneys. Heating distribution, energy source and heating methods. Air Conditioning: Describe energy sources and cooling methods. Including means of distribution. Interior: Walls, ceilings, floors. Steps and railings. A representative number of windows and interior doors. Garage doors and garage door operations. Counter tops and a representative number of cabinets. Insulation and ventilation: Insulation and vapor retarders in unfinished spaces. Ventilation of attics and foundation areas. Mechanical ventilation systems.